Combustion converts the carbon in the fuel to CO2. For each type of fuel there is a maximum CO2 that can be converted. When you select the fuel in the analyzer, the CO2 is calculated from the fuel type by the percentage of O2 left in the flue gas. Typically for natural gas (at least with a digital combustion analyzer) the ultimate CO2 is 11.7%. Some analyzers also allow for the max CO2 to be input by the user if the heat content of the fuel is known. The ultimate CO2 would be derived from stoichiometric combustion in which there is no excess air and no excess fuel present during the combustion process. In reality, in the HVAC industry we are striving not for stoichiometric combustion, but complete combustion in which all hydrogen and carbon in the fuel are oxidized to H2O and CO2. For complete combustion to occur, we have to have excess air, or air supplied in excess of what is needed typically because of poor mixing of the fuel and air during the combustion process. If excess air is not provided we will not have the complete conversion of carbon to CO2, and will end up with the formation of partially oxidized compounds, such as carbon monoxide and aldehydes. For maximum combustion efficiency low excess air is desirable. For residential furnaces it is typically 50% however additional air may be required for dilution to prevent condensation of the flue gasses. This could be introduced into the appliance after the point of combustion through a draft diverter or as excess air which goes completely through the combustion process. Classically combustion analysis was done using Fyrite® absorbing fluid which is selective in the chemical absorption of carbon dioxide or oxygen, respectively. The CO2 reading on the dumbbell or shaker analyzer is used to calculate combustion efficiency. KIT ITEM DETAILS FOR THE TECHIE! Fyrite® CO2 Indicator 20% filled #11-7032 – The Fyrite Carbon Dioxide Indicator measures the percent CO2 in a flue gas sample. True Spot® Smoke Tester and Oil Burner Smoke Scale #21-7006 – With the True Spot Smoke Tester and Smoke Scale, you can get an accurate indication of smoke content in flue gas. Fire Efficiency Finder/Stack Loss Slide Rule #10-5064 – The Fire Efficiency Slide Rule is a quick and easy way of determining combustion efficiency and stack loss from the results of the CO2 and stack temperature tests. Tempoint® Dial Thermometer 1000 deg. #12-7014 – High stack temperatures are cause for special concern and may indicate a serious condition. Model MZF Draft Gauge (+0.05 to -0.25") #13-7019 – The intensity of draft determines the rate at which combustion gases pass through the boiler or furnace. With the MZF Draft Gauge, you can determine if draft is excessive or insufficient. Moisture Absorption. Material #11-0121 - Insures that liquid moisture does not enter the Fyrite and keeps and particles in the sampling stream from gumming up the works! Sampling Hose Assembly #11-7029 - Specially designed to extract the perfect sample. 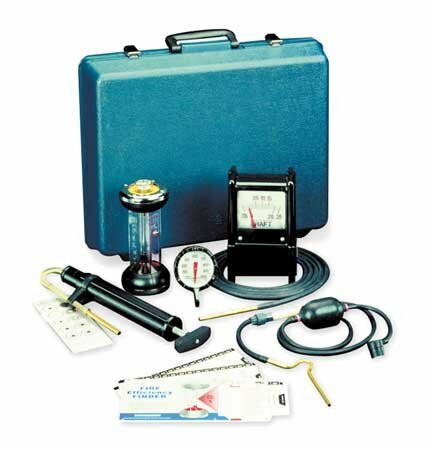 Large Carrying Case #10-0100 – Protect all the Instruments in a Bacharach Oil Burner combustion Test kit in this rugged, plastic carrying case. 718 TruReward$ points will be placed in your account when you buy this item.